The Department welcomes applications from prospective graduate students for Fall admission only. The deadline for both MS and PhD applications is January 15, 2019. Please specify which program you are applying for when you submit your application (MS or PhD). New: The graduate school at UMass Amherst is waiving the application fee for any Master's Program applicants from all undergraduate students from the Five College Consortium (including UMass students). All additional materials should be sent to the Admissions Office at the Graduate School, NOT the Department. No exceptions. How do I apply to your Graduate Program and when is the deadline to apply? The application for admission the UMass Graduate Program can be found online at our University’s Graduate School Website (http://www.umass.edu/gradschool/) and our deadline for application submission is January 15th. When can I expect to hear from the Department with a decision on my admission to either the MS or PhD Program? We typically send out 2 to 4 rounds of admittance letters, the first of which normally happens in the beginning of February with additional rounds throughout the months of February, March, and often April. All decisions will be finalized by April 15th, at the latest. All applicants will receive an email version of their admittance or rejection letter from the Department. The email will be sent to the email address used on your application. All applicants who are sent an offer letter will also receive a hard copy of the same offer letter in the mail, delivered by the USPS at the address indicated on the application. How many students are admitted to the Chemical Engineering Graduate Program each year? Our program is highly competitive as we often have over 300 applicants each year and our typical class size ranges from 10-15 students. If I am not a Chemical Engineering Major, can I still apply? Yes, we accept students from all majors into our program as all of our students must register for our 4 core Chemical Engineering Courses during their first semester of study. Do I need a MS Degree before I may apply for your Ph.D. Program? What are the courses I will need to take during my first semester? What are the average GRE scores for students who have been admitted to the Chemical Engineering Graduate Program? The average GRE scores for students who have been accepted in the past year are Verbal 157, Quant 165, and Analytical 3.5. Please note that the provided scores are averages and some students have been accepted with lower scores and students with higher scores have not been admitted. Many criteria go into the admission decision. What is the average GPA for students who have been admitted to the Chemical Engineering Graduate Program? The average GPA for past students has been 3.62 with a minimum typically no lower than 3.0. Please note that the provided GPA is an average and some students have been accepted with lower and GPA’s, and not admitted with higher GPAs. All of our students must also maintain a GPA above a 3.0 to remain in the program. What is the average TOEFL score for students who have been admitted to the Chemical Engineering Graduate Program? Is there a minimum acceptable TOEFL score? Can the TOEFL be waived? Does the Chemical Engineering MS Program offer an Assistantship package or other funding? No, at this time, there is not a Departmental Assistantship or funding provided with a MS offer. However, there may be some financial resources that you can find at UMass or beyond to help overcome a financial burden. You may also be able to search from some current and upcoming on campus job opportunities via the Student Employment Office. Does the Chemical Engineering Ph.D. Program offer an Assistantship package? Yes, students who are accepted into the Chemical Engineering Departments’ Ph.D. 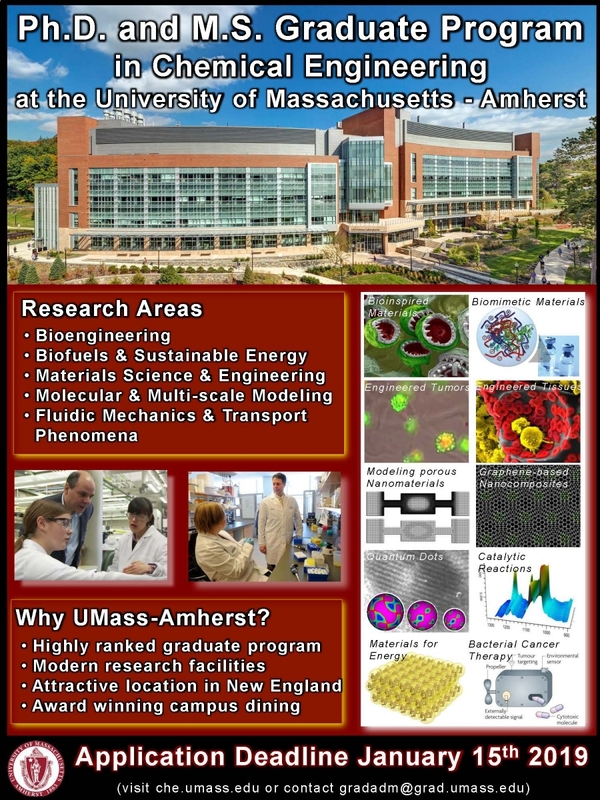 Program at the University of Massachusetts are offered a full graduate research assistantship and therefore you will not need to have your own financial assistance. For Fall 2019, we project the package will include a $34,889.40 living expenses stipend plus tuition, and health care coverage. The stipend would be paid bi-weekly with a total of $34,889.40 for the year. You would be responsible for other miscellaneous University fees, which currently total approximately $2,200/year plus a one-time entering fee of $507. We would pay for 95% of your individual health care coverage, a benefit with a current value of $2,821.50. [If you should need family coverage, we would pay 90% of the fee.] Please note that many graduate-school offers expect you to pay for full health care coverage and fees from your stipend. The tuition for graduate students in good standing and on full financial aid is waived. The value of this waiver is $28,669 per year. The assistantship is contingent on your official admission by the Graduate School and requires no work above or beyond that required for your regular thesis and degree program. It is our intention that this assistantship will be continued to the completion of your degree program upon your satisfactory academic and research progress. For the Masters Program, there is no Assistance provided. Is it possible to start as a MS student and then switch to PhD? Students can move to the PhD program during or just after finishing the MS program if there is satisfactory progress AND they can find a faculty member with available funding to take them into their lab. Will I be able to interview with Faculty during the application process? How will my Ph.D. Advisor be assigned? There is no interview associated with the application process. If you are accepted, there will be time to speak with faculty about your interests during our new student orientation. Each Fall we hold faculty presentations with the new students so that the available projects can be discussed. Each student will be asked to rank the available projects and then we strive to place each student in a project that is one of their first 3 choices (occasionally this is not possible). The full list of projects available is typically not complete until that Fall. Most faculty members typically fund one or more projects each year, but funding is unpredictable. Some years, faculty may take on no new students. You may look through our full list of Faculty Members and see their areas of research on their websites through this Website (https://che.umass.edu/research). How can I submit application materials manually? Admissions materials not submitted electronically can be mailed, emailed, or faxed to the Graduate Student Service Center. Please note that the Graduate School handles application inquiries from applicants across campus and they may be slow to respond, especially during busy times. Can I submit unofficial or manually entered test scores and/or transcripts to my application now and then load official test scores and/or transcripts after the application deadline? Yes! You may certainly upload and enter unofficial test scores and/or transcripts to your application for our review process. We begin reviewing applications shortly after the January 15th deadline and will use whatever data is loaded on the deadline for review. Offers of admission will likely be sent out sometime in April. If you’re offered admission to our program, your offer will be contingent upon us receiving the official test scores and/or transcripts (which must match your unofficially reported scores or transcripts). All official data must be filed with the Graduate Admissions Office prior to the start of the Fall semester. We do encourage you to try to have all official scores and transcripts in on time though. Please note, if your test scores or transcripts are not showing in your online application file, please feel free to email them directly to wallace@ecs.umass.edu to ask that they be included in the review process. This will not add the data to your online application but it will be included in the Departmental review process. Materials that you would like added to your online application should be emailed directly to the Graduate Admissions Office at gradadm@grad.umass.edu. Bioengineering: cellular engineering; metabolic engineering ; targeted bacteriolytic cancer therapy; synthesis of small molecules; systems biology; biopolymers; nanostructured materials for clinical diagnostics, synthetic biology and cancer immunotherapy. Catalysis and Sustainable Energy: conversion of biomass to fuels and chemicals; catalytic fast pyrolysis of biomass; microkinetics; microwave reaction engineering; biorefining; high-throughput testing; reactor design and optimization; fuel cells; energy engineering. Fluid Mechanics and Transport Phenomena: biofluid dynamics and blood flow; hydrodynamics of microencapsulation; mechanics of cells, capsules, and suspensions; modeling microscale flows and transport phenomena; hydrodynamic stability and pattern formation; interfacial flows; gas-particle flows. Materials Science and Nanotechnology: design and characterization of new catalytic materials; nanostructured materials for nanoelectronics, optoelectronics, and photovoltaics; graphene and carbon nanomaterials; synthesis and characterization of microporous and mesoporous materials; colloids and biomaterials; membranes; biopolymers; rheology and phase behavior of associative polymer solutions; polymeric materials processing. Molecular and Multi-scale Modeling & Simulation: computational quantum chemistry and kinetics; molecular modeling of nanostructured materials; molecular-level behavior of fluids confined in porous materials; molecular-to-reactor scale modeling of transport and reaction processes in materials synthesis; atomistic-to-continuum scale modeling of thin films and nanostructures; systems-level analysis using stochastic atomic-scale simulators; modeling and control of biochemical reactors; nonlinear process control theory. Fluid Mechanics and Transport Phenomena: biofluid dynamics and blood flow; hydrodynamics of microencapsulation; mechanics of cells, capsules, and suspensions; modeling of microscale flows; hydrodynamic stability and pattern formation; interfacial flows; gas-particle flows. To see the faculty member groupings, visit https://che.umass.edu/research. 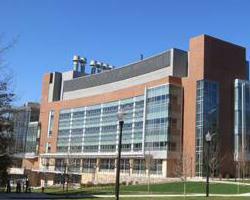 The Department occupies instructional, research and administrative space in four buildings in close proximity: the Goessmann Laboratory, the Conte National Center for Polymer Research, the Engineering Laboratory II (Elab II), and the newly opened Life Sciences Laboratories Building (LSL).